Several days ago, the ECB sparked the ire of pretty much anyone with a working frontal lobe when it made the indefensible claim that, drumroll, QE had helped reduce inequality. That’s right, reduce. The claims are: (1) by lowering unemployment at the lower end of the socio-economic ladder, QE put money in people’s pockets; (2) higher stock prices didn’t have any influence on wealth inequality; and (3) higher house prices helped to reduce inequality. Well clearly they have. It’s been a -- exacerbate makes it sound like they shouldn’t have done it. They did to get us out of the global financial crisis what they had to do. A side effect of that was asset inflation which, of course, only benefited the people who own assets and that has created a widening of the net worth gulf. So no, QE did not help reduce inequality: on the contrary it made inequality reach unprecedented proportions, resulting in the populist, anti-establishment movement sweeping across Europe... oh, and Brexit in the UK and Trump in the US. But the nuance was not lost on observers, who noted that by making this claim, the QE was merely launching a trial balloon and setting the stage for even more wonderful, noble QE. And in keeping with carefully phrased trial balloons, earlier today the San Francisco Fed, best known for wasting millions in taxpayer funds on research to overturn what is blatantly obvious even to five year olds, released what may be the next, even more critical trial balloon, asking "How Much Could Negative Rates Have Helped the Recovery?" and finding, surprise, that it would have helped by quite a bit. As a reminder, unlike Europe or Switzerland, where deposit rates have been negative for years, the US central bank is generally perceived as not having a mandate to take rates below the "lower bound" or negative, i.e. to implement what is affectionately known as "NIRP." 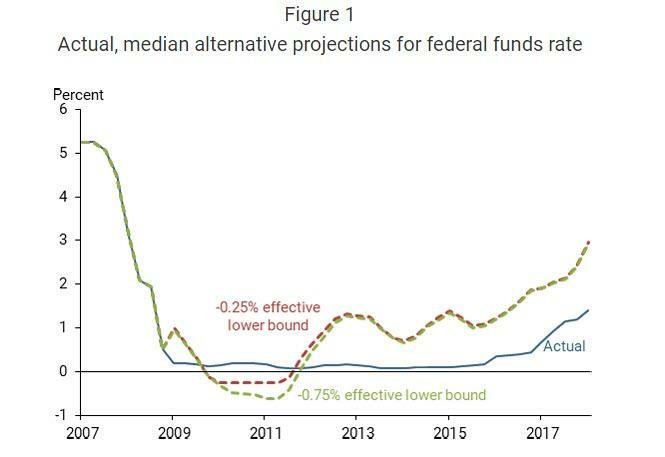 And yet, according to the regional west coast Fed this is a mistake, because research from San Fran Fed's Vasco Curdia, "allowing the federal funds rate to drop below zero may have reduced the depth of the recession and enabled the economy to return more quickly to its full potential. It also may have allowed inflation to rise faster toward the Fed’s 2% target. In other words, negative interest rates may be a useful tool to promote the Fed’s dual mandate." In short, NIRP would have made the recession shorter and less acute according to the San Francisco Fed, and since it is impossible to argue the counterfactual, we now have "research" that sets the framework for what happens next. Needless to say, the implication of this report is dramatic because what it suggests is that, in a tortured trial balloon just like that launched by the ECB last week according to which the next QE-driven downturn can only be solved with even more QE, so the US Federal Reserve system now has a blueprint for how to handle the next economic recession/depression, and - simply said - it will involve NIRP. Here once can extrapolate what Rabobank's Every said last week, when he concluded that he doesn't think "the ECB realises just what a stupid mistake it has made. It is never a good thing to be spotted as a shill: crowds tend to get angry. Worse, the ECB have made a (false) economic case that QE helps inequality, when actually it exacerbates it. That means when we do more QE people will be expecting to see greater equality and will get the opposite – again, the crowd will get nasty." Now replace the above with Fed instead of ECB and NIRP instead of QE and you can see where this is heading... and for those who can't, the answer is simple: there is now a green light to use not only more QE during the next recession, something which Powell already hinted at last week with his shocking dovish reversal, but to go all the way and drag rates negative, ignoring the fact that despite NIRP and QE currently in place, i.e., all of its monetary policy ammo, Europe's economy is once again on the verge of a recession. And since we know what will happen when the next recession strikes, we also can extrapolate what happens when neither QE nor NIRP succeed in restoring economic growth as both the ECB and Fed have now promised: as Rabobank summarized "That means when we do more QE people will be expecting to see greater equality and will get the opposite – again, the crowd will get nasty." We can't wait to see the analysis the world's central banks will use in several years to explain why, in agreement with Paul Krugman, civil (and no so civil) war is actually quite beneficial to GDP growth.